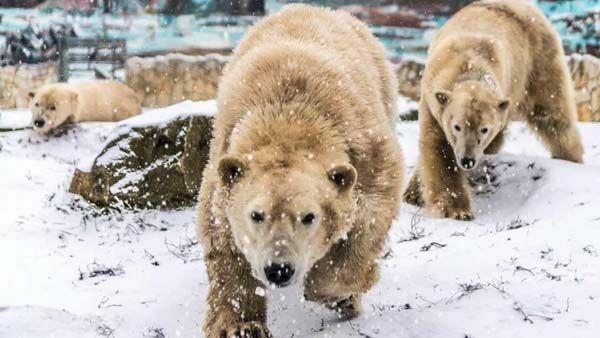 It’s been quite a while since we had news from the Sóstó Zoo. 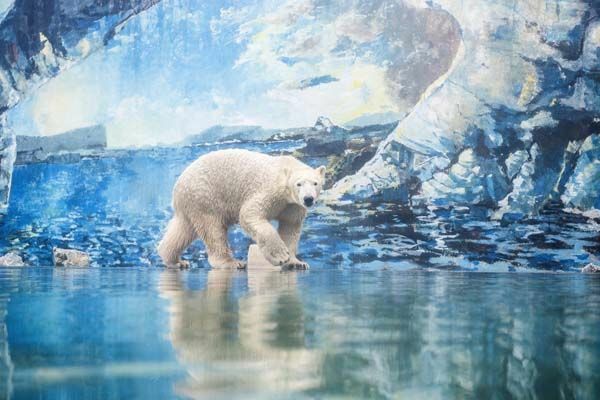 I haven’t got any news now but I want to show you some nice photos of the zoo anyway. Fiete looks gorgeous as always! During the walk Fiete met lovely Snezcana. What a nice portrait of a nice couple! To our white friends’ delight it’s been snowing in Hungary, too. Fiete, Zora and Snezcana – the whole family in the same photo. 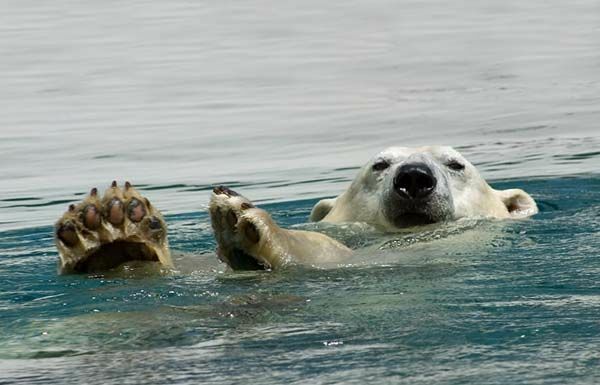 It’s polite to swim close to the visitors and say ‘hello and welcome’. 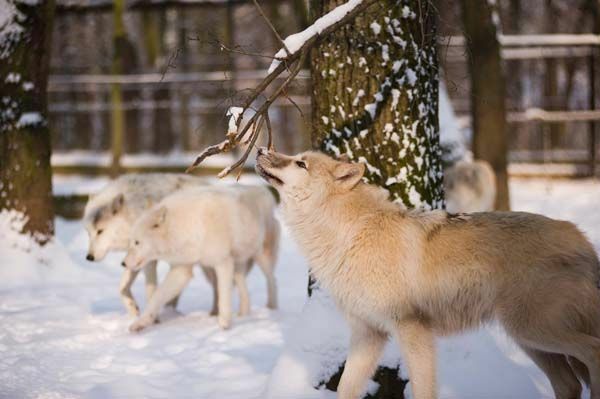 The wolves can make themselves almost invisible …. 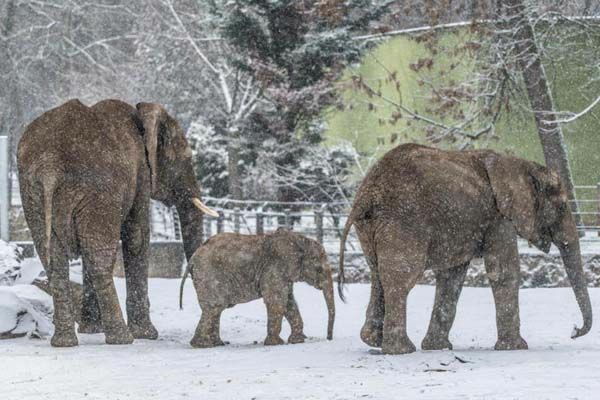 The elephants didn’t seem to mind the snowing. 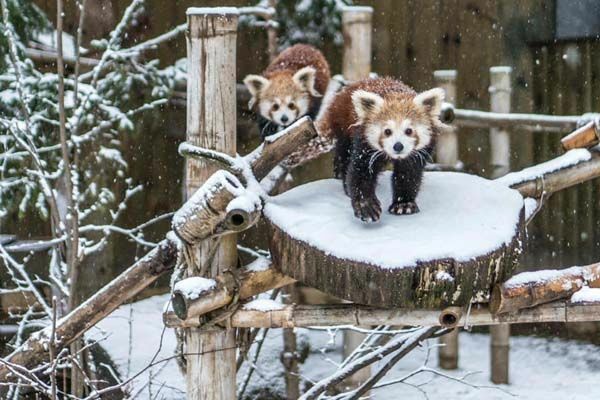 The red pandas with their cute faces look very curious. What’s this white stuff? 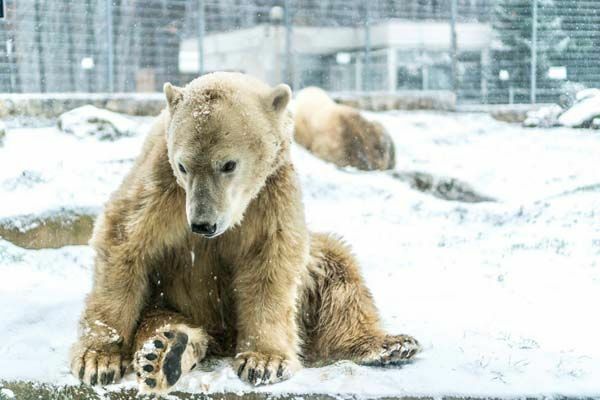 This was the zoo’s new year photo of Fiete. I can only write that he looks very, very handsome. 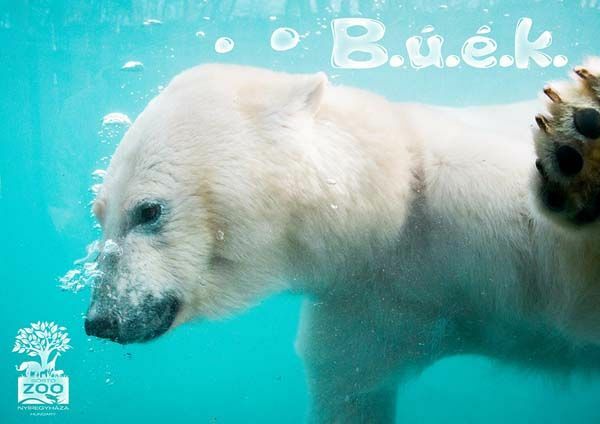 Thank you for the pictures from the zoo Sosto. It looks like Fiete is doing well. 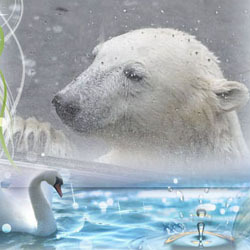 It’s so nice to read about the Hungarian Polar Bears! They’re all three so handsome and cute!! I hope they do well! Fotos von Larsson zu sehen. 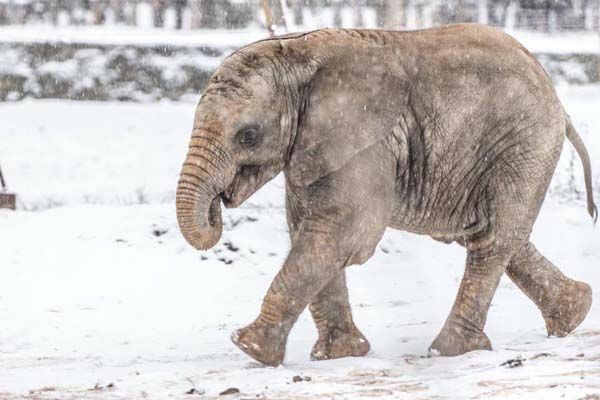 darf der kleine Elefant in den Schnee. 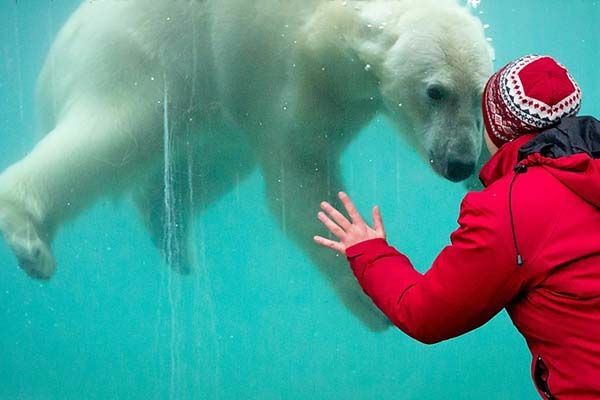 Interaction between keepers and/or visitors and the zoo animals is (next to) always fun! 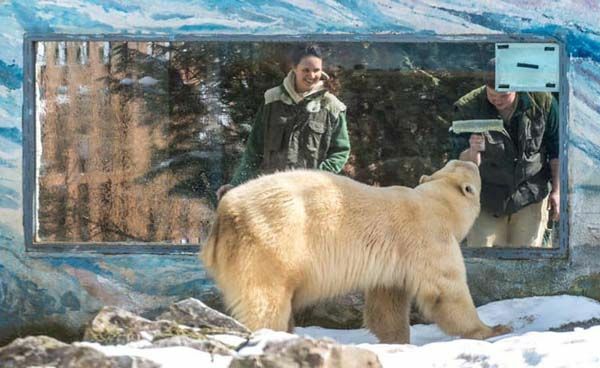 Thanks for the nice photos and the information you have looked for and found about FIETE and the SOSTÓ-ZOO, deasr MERVI. 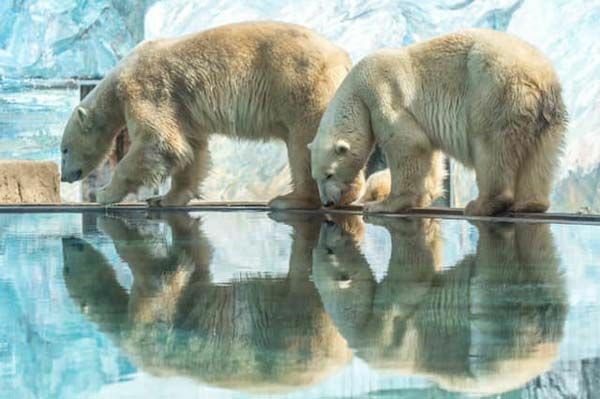 The mirroring photo is fantastic but I also like any of the other pics, of the polar bears as much as of the other pretty animals. wie schön, mal wieder etwas von Fiete zu erfahren. Er ist wirklich bildhübsch und das Familienfoto ist große klasse! Mein Favorit ist das Foto mit dem Kind an der Scheibe. Elefanten nehmen die schlüpfrige Angelegenheit gelassen hin. Danke für die schönen Fotos mit lieben Grüßen! Thank you for some news from Hungary! I´m happy that Fiete and his ladies are doing fine. All the pics are fabulous and some are even worth to be published in a big magazine! 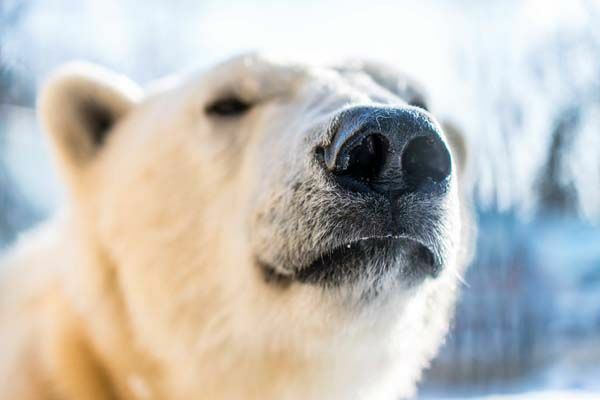 My favourites among the polar bear photos are the first one with this shining liquorice nose and the proud expression, the mirrored portrait of a nice couple, the relaxed backstroke, the whole polar bear family in one pic and the meeting of Fiete with a child at the pane. The other animals look fantastic too! 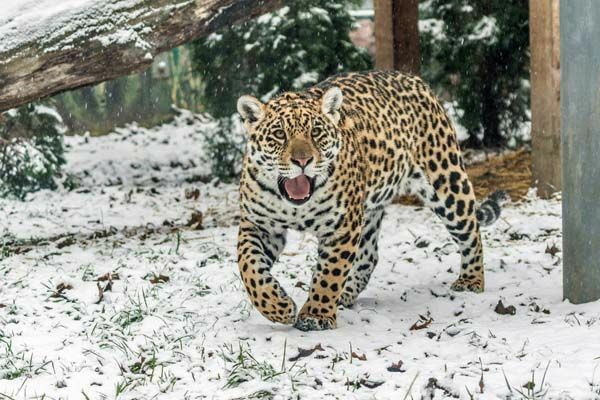 The very spottish looking leopard is a beautiful big cat, the wolves have a nice winter fur and the red pandas are as cute as always, but my sweetheart is the brave little elephant marching straight through the snow. ich finde es auch super, mal wieder neue Fotos von Fiete zu sehen, und freue mich dass es ihm so gut geht. Groß ist er geworden, der “Kleine”. Schön das Foto gemeinsam mit Snezcana und auch Zora im Hintergrund. Ob Fiete wohl immer noch bei Zora nuckeln darf? 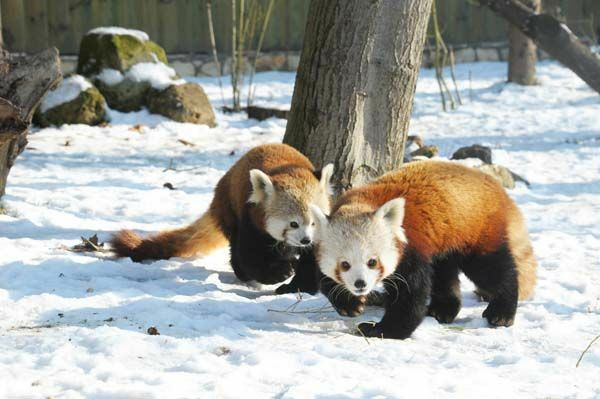 Aber auch die Fotos von all den anderen Tieren im Schnee sind wunderschön. Danke. thanks for showing Fiete and other animals. They all look good in the snow. Danke für die wunderschönen Winterbilder aus Ungarn. Fiete sieht echt toll aus. I am so delighted to see such pictures from Sosto. 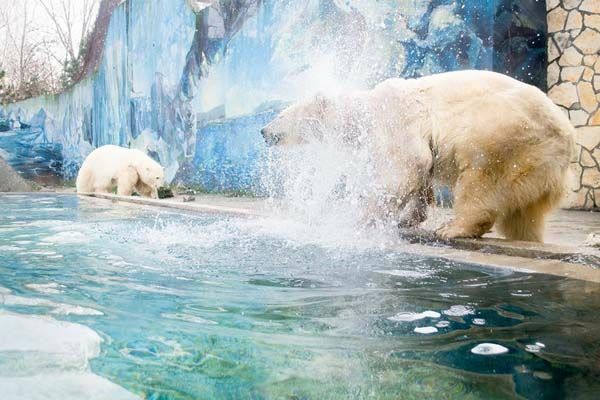 We were very worried about Fiete and what would happen to him, but the Sosto Zoo seems to be a very good place. Their photography is first rate. Log in | 53 queries. 0.842 seconds.